Take 25% off your purchase at J.Crew today! I’m adding these midnight floral pants, this zip-adorned sweater, and this buffalo check shirt to my cart. I’m also dying to buy this pinstripe topcoat… Click here to shop all new fall arrivals. Just enter code SHOPFORFALL at checkout! ASOS is also offering 25% off new season styles like this baby blue boyfriend coat, a fresh pair of fall sneakers, the perfect skirt for holiday parties and more! Click here to shop all the marked down merchandise. If you can’t tell by this post (or if you scroll to the bottom of the page to my SHOP section), I’m really into shearling for fall. It’s a very popular trend this season and everyone seems to be utilizing this cozy fur in everything from bags to shoes to jackets. Right now I’m decided between two Loeffler Randall pieces featuring shearling – this backpack and this clutch. Which is your fave? #4 these heels are sooo pretty. So digging those suede heels! So many pretty goodies! That Acne coat is insane. Love. 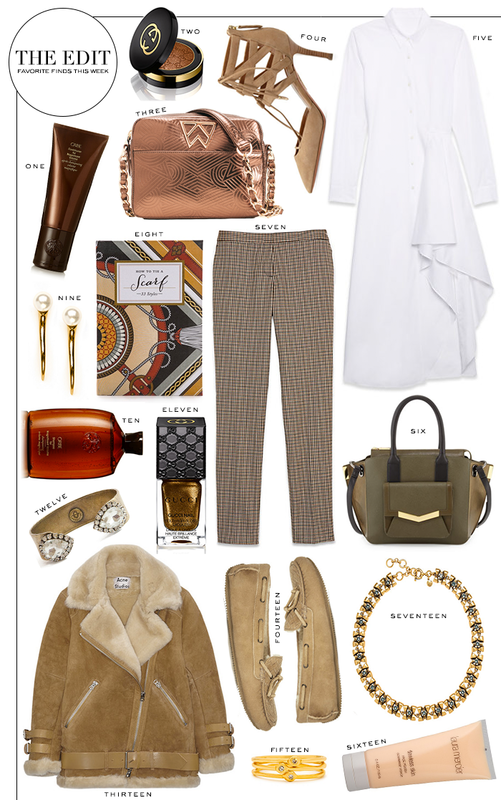 This post makes me feel officially ready for fall – so many fun items to wear! I particularly love those great pants, number 7. So chic! SO hard to pick favorite but I love the tote and the Gorjana stack rings! I’ll take the Theory dress. Please and Thank you. Great picks! The baby pink heels are amazing.